Yesterday morning I woke up and wanted to bake a cake. So bake a cake I did. 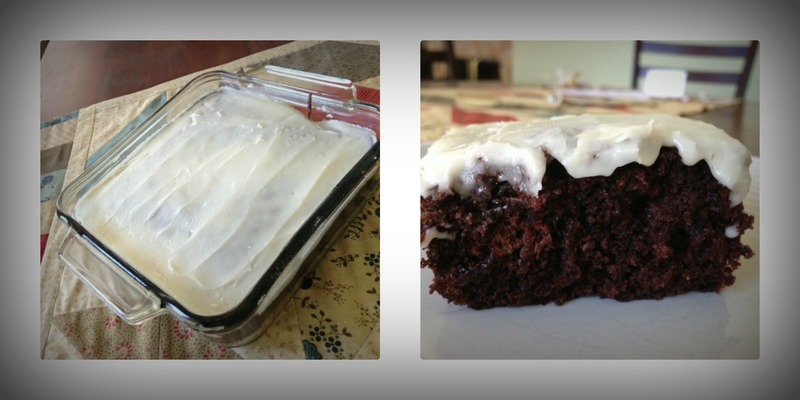 I pretty much perfected my moms wacky cake. And by ‘perfected’ I mean that I actually waited for it to cool before icing it. I have never had that kind of patience before. And it paid off. So tasty. And I ate a big dumb piece of that cake, so of course I had to take the dogs out somewhere so that I can burn at least one bite off. And I guess they needed the exercise too. 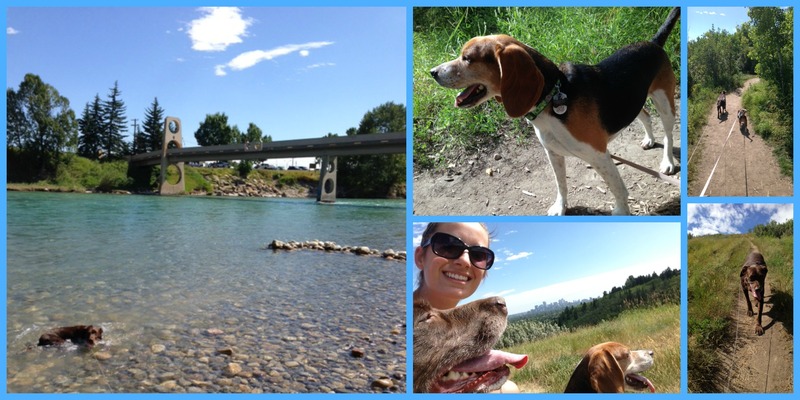 We headed to Edworthy Park because it was close and gave us what each of us wanted: water to ‘hippo’ in for Layla, bushes and trails for Reggie to sniff and pee on, and a steep hill for me to break a sweat. Happy group all around. 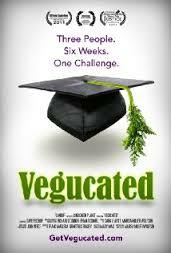 I watched Vegucated. Have you seen it? It’s a documentary about a vegan women who chooses 3 different people in NYC to live a vegan lifestyle for 6 weeks and see how it affects their health and whether they’ll continue the lifestyle. Also, it showed lots of raw footage from slaughter houses which totally grossed me out. I mean, I was already aware of how yuck it was, but the images are just…..well, yikes. Tyler caught part of it and suggested we go vegetarian at least once a week. Ha! We shall see. PS: I like bacon. I FINALLY got a strength workout in. It has been almost two weeks since I did a legit strength workout, and I could almost immediately feel it. Heading to a yoga class afterwards really helped. 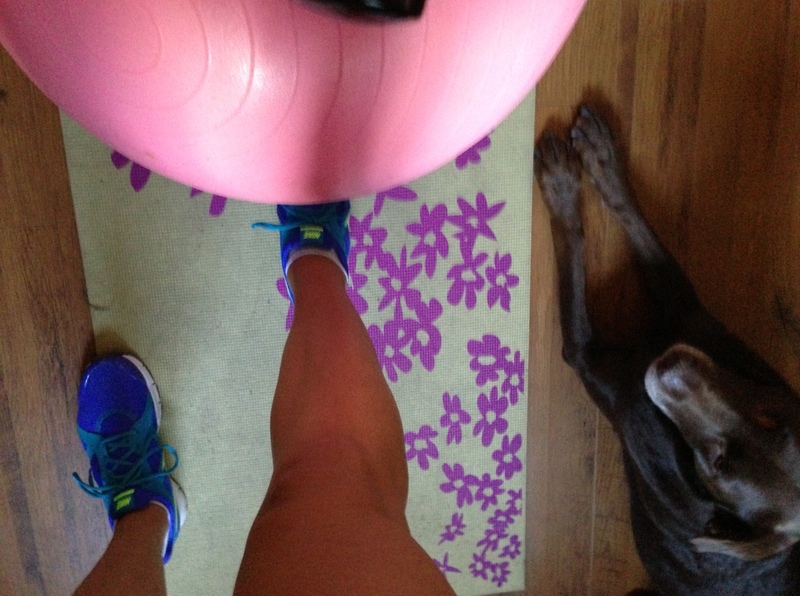 Anyhoo, I opted for the workout at the bottom of this post. I chose to do each circuit 2x through. Layla joined in for most of it. In case you were wondering, I am a master at the camel pose (haha rhymes with camel toes!) Ok, not a master, but it was one of the few moves I hated and could never do without wanting to pass out, and now I really get into it. I’m so much more than a piece of paper! 1. Rude Boy- Rihanna. I always think of the route I take when I do an outdoor run in my hometown (Glens Falls, NY) I would run from my parents house to the high school and back and I think I did it a few too many times when I first added this song to my playlist because I think I heard it almost every time I got to this one intersection and would have to run in place. 2. Genie in a Bottle- Christina Aquilera. I can ALWAYS picture the outfit she wore in this video. It prompted me to buy a pair or baggy orange pants, too. Believe me, I didn’t look anything even CLOSE to her. 3. Lose Yourself- Eminem. Oak Square YMCA Tuesday night Kix class and having Sarah freak out because it was her favorite. (Sorry only about 6 of you will get this. And probably laugh. Hi Sarah! Now you know I’m thinking of you!) And I picture Mekhi Phifer. 4. Paradise- Coldplay. Makes me want to be in the crowd of one of their concerts and wave glowsticks. 5. Just Dance- Lady Gaga. First time I heard this song I was at me then-favorite bar, McFaddens (in Boston. And I just read that it closed! So sad, that was my favorite place when I was 21) and was wearing a gaudy purple top and only knew the words ‘just dance’ and jumped throughout the entire song. Then the bartender gave me and my friend shots. 6. Kung Fu Fighting- Carl Douglas. Class talent show back in elementary school. The grade above mine did a routine to this song and I can picture it like it was yesterday. Plus, I want to kick someone when I hear it. Not out of anger. Just out of awesome kung fu-ness. 9. Harder to Breathe- Maroon 5. Held a party at my house while my parents were gone the summer I graduated high school. String christmas lights in the basement (you know the kind that have all those different flashing options) and someone brought the Maroon 5 CD over and it played on repeat the whole night. Also, I was fascinated that the beat of this song went oh so well with the particular flash setting for the christmas lights. So there you have it for odd memory associations! I’d love to hear some of yours!! awww wish i was there! I have the best/worst association for rude boy. A girl I know from my hometown that I’m not close with but friends with on Facebook once posted that she was listening to it and she’s glad that her boyfriend, also from my hometown, doesn’t have those problems (meaning getting it up and being big enough). UGH tmi, lady! Why did she have to ruin that song for me! What’s a wacky cake? I want one! Hahaha I loved your music associations. Rude Boy reminds me of ellipticalling myself into shape before my wedding. I’d close my eyes & pretend like I was in a hip hop music video. Haha i almost always get into the beat when i;m working out and sometimes i trip on the treadmill because i sway my hips to the music! I always associate a memory with a song, some songs bring back good and some bad, haha! In fact some songs remind me of an ex and those get shut off right away, lol! Love that you are doing yoga so much! I saw your comment on my blog, hot yoga rocks! I love it the best! That cake looks delish! How you don’t weigh 500 lbs with all the yummy food you make is beyond me! I think I gained weight just seeing that picture! I have many music associations but the problem is that I never know/can remember the name of a song so I couldn’t actually tell you the association unless we are actually listening to the song together. Genie in a Bottle- now that makes me feel old. haha how I dont weight 500 lb is beyond me. i do opt for all my other meals to be full of protein fruits and veggies (during the week)! Yum! I used to be such a “baker” but now that I’ve cut back on sweets I dont do it as much. And, I don’t know how to come up with baking recipes on my own 😦 I can’t think of any music memory, but I know I have SO MANY! !